← How does Visa Calculate its Currency Exchange Rate? What was the source data for the population numbers? I downloaded population data from the US Census that sorted population by Zip code (this was in April 2012). I used the “2010 Estimates” column in the data set. Could be converted into a custom Google map so individual addresses or places could be found? Just doing a spot check for northern Montana, there appears to be a flaw in the methodology. Northern Montana border (north of Great Falls) distance to Seattle (~530mi)…distance to Denver (~698mi)…using great circle route. I just checked on this myself and you are right. There is something a little off with the polygons – which were generated using the “Thiessen Polygon” tool in ArcGIS 10. It looks like the program had a tough time creating the polygons because it was on such a large scale (all of USA). The polygons in the Virginia and Maryland map are much more accurate. Just thought I’d let you know that I updated the map – should be error free now. Would it be possible to do this as a function of time, say start in the early 1950’s and see how it’s changed with expansion and relocation? It most certainly would be possible – but also very time consuming to make it look pretty and to include population data. I’m not sure there is good GIS ready census data before 1970 either. Visually this looks wrong. Surely the borders should be perpendicular bisectors. Or does this suggest that this map projection significantly distorts distances? Thanks to your and a few other comments, I found the errors and updated the map. In regards to the projection, though the map is error free, there might be some distortion when drawing lines. I used a Albers equal-area conic projection, which preserves polygon areas but has some minimal shape distortion. might the curvature of the earth play a part in the larger territories being slightly off in the map? Hi Zach – it turns out that there was simply an error in the program I used to calculate the polygons. I went back and updated the map by hand, so now it is error free. Its possible there still might be some straight line distortion because I am using a Albers equal-area conic projection. First, great map. It’s intriguing to see this in relationship to the “Home Market Map” that MLB has that insanely declares the entire state of Iowa the home market of 1/5th of MLB. Have you considered redrawing the map merging the four multi-team markets (NY, LA, Chicago, and SF/Oakland) into the midpoints between the two ballparks? 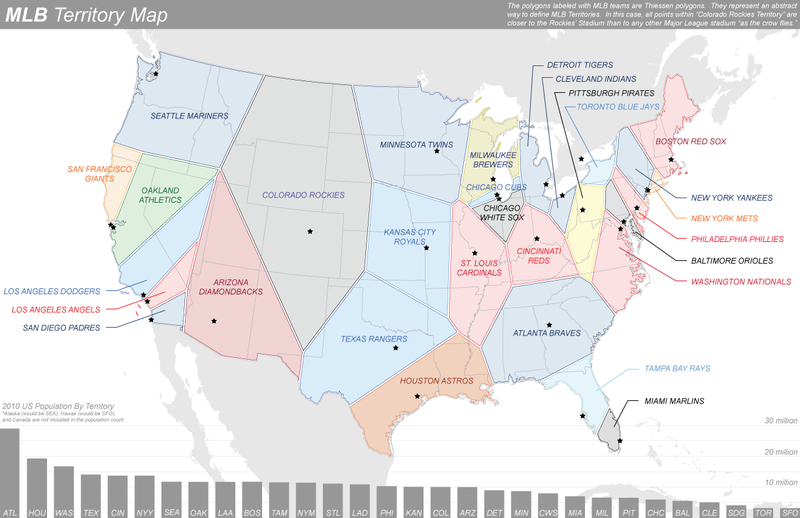 I don’t think it’d change much, but it’d eliminate the weird situation where, say, the Cubs have this small swatch and the Mets have only Long Island. Thanks Joe! I definitely gave a lot of thought about what to do with the multi-team markets, and your solution makes sense. In reality people within the 2 market metro areas probably have much more mixed allegiances, although I would say most of the Mets fans I know are from Long Island and there is a very strong South Side = White Sox and North Side = Cubs feeling in Chicago. it just me or were you really on a hiatus for a while?